When we bought our house in December 2006, there was a surprise in the garage: the former owners had left us a huge old chest freezer. 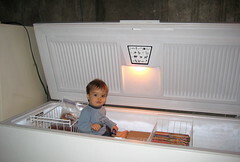 Now, Jak and I had a chest freezer already, a smaller model we’d bought at Costco about five years earlier. So this one was a bit superfluous, more than our family of two-and-sometimes-four needed. In the course of the move, however, it was convenient to move our frozen food into the windfall freezer temporarily while our original freezer was in transit. ‘Temporarily’ lasted, as it so often does, almost two and a half years. 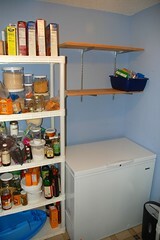 Last month we finally got around to rearranging the garage and transferring everything to the smaller freezer. I assumed that doing so would save us money — older & bigger versus newer & smaller seemed a no-brainer — but had no actual evidence. Savings: $34.55 per year, or about $2.88 a month. (We have some of the country’s cheapest electricity here in Seattle; if we lived in New York, where it’s most expensive, the annual cost difference would be about $80.) I prefer to think of this as $34 we’re going to save every year from now on, rather than $86 we spent needlessly by procrastinating this task since moving in. Ahem. In the month since making the switch, I’ve already seen improvements in frozen-food turnover efficiency. I still think I need a better record-keeping system for both fridge and freezer though; I’ll work on that! The EnergyStar calculator also tells you how much you’d save in electricity by buying a new freezer that meets current EnergyStar specs. In our case, this is a mere $7 per year — not a patch on the cost of a replacement, not that we were considering one anyway. I am going to resell the windfall freezer, once I have an afternoon to spend cleaning it out. For someone with no second freezer at all, it could be a real bargain — especially if they have a large family or are carnivores!